The Rolex Daytona jubilee bracelet conversion. Update: The Rolex Daytona jubilee bracelet conversion. The Rolex (Zenith) Daytona meets the 62510H bracelet. New photos from the archive! We’re going through our articles from the past and try to update them every now and then if possible. When looking at this post I realised there are some similar photos in our photo archive. The Rolex Daytona Jubilee bracelet conversion. Ever wondered how your Daytona looks on a jubilee bracelet? These photos show the same Rolex (Zenith) Daytona ref. 16520 as used by Hannes and were shot somewhere back in 2011. Unlike the picture from Hannes, where you can clearly see that the endlinks of an oyster bracelet have been used, the photos we found in the archive have the matching jubilee endlinks. On the wristshot below you can see a small gap between the case of the Daytona and the Rolex 502T endlinks. If I’m correct, these 502T endlinks originally fit the 62510H jubilee bracelet on the Rolex GMT-Master II with reference 16710. The endlinks are similar to the 502B accept for a small opening on the back side, that allows them to be used in the newer GMT-Master II cases without the lug holes. This way they can also be used on the Rolex Daytona if you don’t mind a little gap. 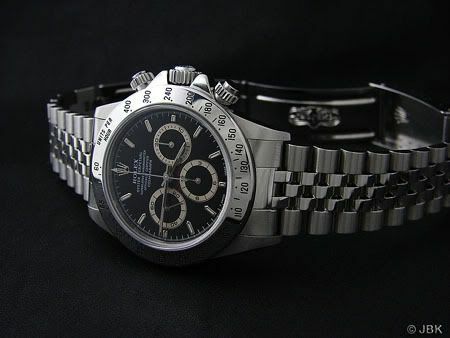 The Rolex Daytona reference 16520 with 62510H bracelet and 502T endlinks.